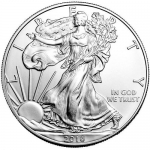 The American Silver Eagle is the most popular silver bullion coin in the world. Production of these coins is based upon demand, and 2014 and 2015 were record-breaking years for the United States Mint in terms of sales. An estimated 44 million American Silver Eagles were struck and sold in 2014, making it easily the most coveted coin among investors and collectors. Now the latest version of the coin is available, with the 2016 1 oz American Silver Eagle available today from the Coin and Stamp Shop.